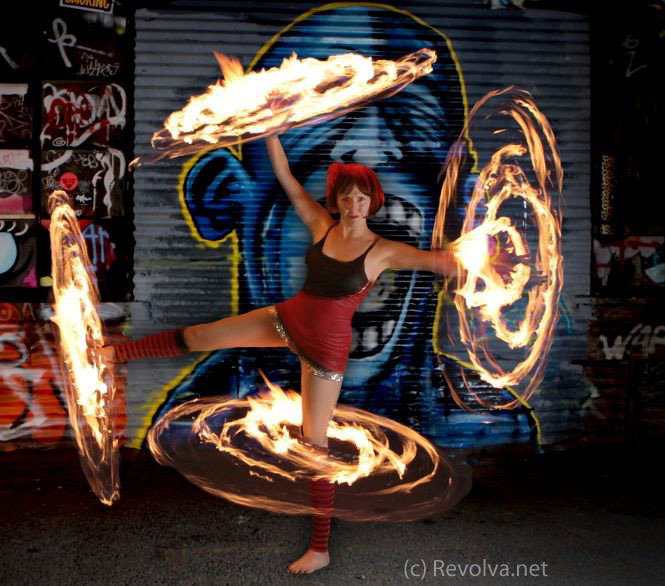 I struggle to make one hula hoop go around my waist, Revolva (an international hula hoop act, circus sensation, writer and character performer) spins FOUR of them…all on FIRE…and all while balancing on ONE LEG! Amazing. Being a role model for girls and women is of paramount importance to Revolva. That’s why you’ll find her exploding onto the stage with tight technical skills and extra humor, sometimes talking into a mic instead of just doing a beautiful dance, and staying long after the show’s over to chat with any audience members who need to meet a female comedy variety act. In line with her commitment to empowering women, in 2009, Revolva co-founded Circus Artemis: Portland Women’s Circus with Shireen Press of Flamebouyant Productions and Kricket Caffery of Peg Stilts. The mission of the circus was to work with women artists and technicians in a supportive, respectful, and collaborative performance environment and to create high-quality circus productions that inspire, amaze, and empower audiences, the wider community, and each other.